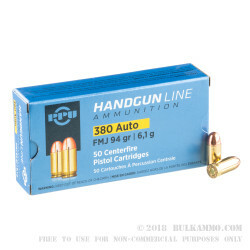 This box of .380 ACP ammo gets you the range time you need at a reasonable cost. 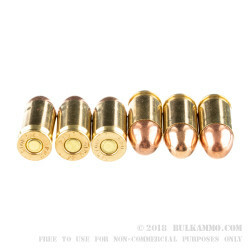 Suitable for use in the Ruger LCP, Colt Mustang, or Sig P238, this load uses a 94 grain full metal jacket bullet and achieves a muzzle velocity of 951 feet per second. 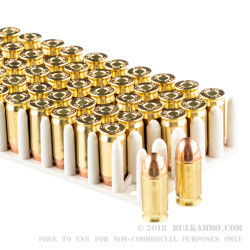 Each cartridge in this box of 50 uses non-corrosive Boxer primers and reloadable brass cases. Prvi Partizan manufactures ammo for more than 400 cartridges at its three factories in Uzice, Serbia. It was founded in a military barracks in 1927 as the Arms & Ammunition Factory of Uzice and became the first freestanding private ammo factory in the Balkans in 1935. After a period of Nazi occupation, during which it produced ammo for Yugoslav “partisan” resistance units, the company took on its present name and fell under the ownership of Tito’s communist regime. After the Cold War, Prvi Partizan underwent privatization and has built a highly successful export business. The company currently employs almost 1,000 people. It adheres to SAAMI specs and uses non-corrosive primers and brass cases in its production. 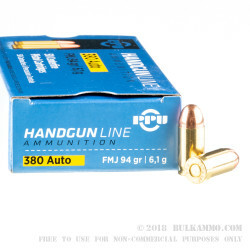 Bought the wife a new .380, needed to take her to the range, as well as replace what's been used since my last time to the armory.Things arrived in my mailbox down at the highway gate in short order and we were off to the range. Things rarely happen more easily. A: Hello Jim! I appreciate you reaching out to us about Prvi Partizan ammunition. All of the PPU ammunition is made in their manufacturing facility located in Serbia.